“Memories of China,” though until now not got a chance to visit China, I have always loved to visit this restaurant. This time I visited the place to celebrate the Moon Festival, which is a traditional occasion witnessed by Chinese. The “Moon Cake” plays an important role in this celebrations. The décor of this place endorsed a cheerful ambiance with apt lighting. As per the Chinese Lunar Calendar, the Mid-Autumn festival is the second grandest festival in China. It takes its name from the fact that it is always celebrated in the middle of the autumn season. The Day is also known as moon festival as at time of the year the moon is at its brightest and roundest. On this day families gather to appreciate the bright full moon and enjoy moon cakes, which I mentioned above along with traditional Chinese food. The festival menu consisted of both non-veg and veg menu. Chef constantly makes an effort to keep veg dishes dominant in the menu keeping the authentic Chinese style alive. Typical Chinese meal starts with tea. I just love to sip that hot tea with light flavor of herbs. I feel it also acts kind of appetizer. Lotus stem, water chestnuts and potato in chef special sauce: It was amazing, perfectly cooked with mild spice level. The Glowing texture of the dish is even appealing and will certainly makes you crave often. Cauliflower cooked in creamy sauce and topped with preserved chili: The Cauliflower cooked perfectly with non-spicy creamy sauce. 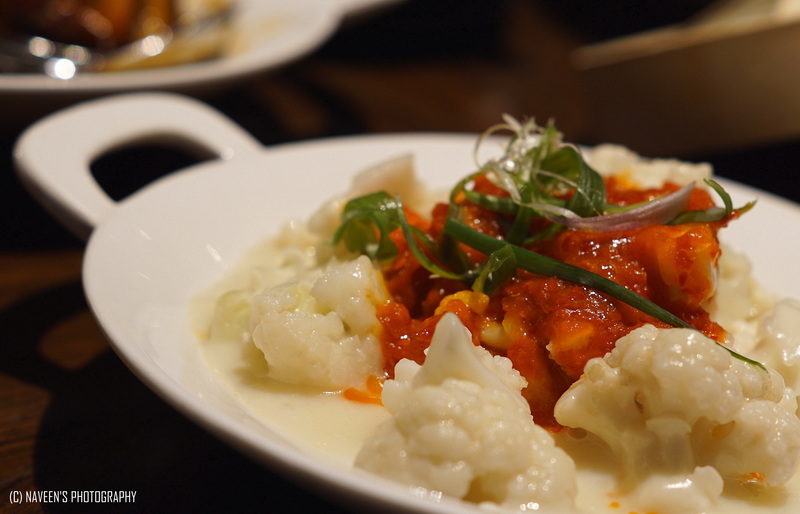 The Cauliflower was slightly crispy and completely unique, which is topped with spicy preserved chili. The Chili certainly made the dish exotic and flavorful. Schezwan fried rice: Though it’s a regular dish. However, the flavor and authenticity doesn’t come in all the restaurants. The Memories of China is one among the best Chinese restaurants for authentic food in Bangalore. Silken Tofu in black bean chili sauce: Well, this was the show stopper for vegetarians. The dish was sizzling hot and looks fabulous. The Tofu cooked with perfection and it tasted great with both Noodles and Fried Rice. I would love to try this again when I visit Memories of China. Crispy Veg starter: Loved it! Finely made by the chef on our request. I was completely impressed with the texture, crispiness, flavor, and taste. We could enjoy the flavor of the vegetable as well as the crispiness together. Moon Cake: Yes, the star of the day arrived in the last as it was the part of dessert menu. Trust me, I remembered the traditional south Indian Holige which we usually prepare at home during the festivals, when I tasted it. Though it differed in appearance and texture, it had a fine line of resemblance of our traditional dish. I think that is where the traditions actually connect through food. The Moon Festival celebrations are now on at Memories of China and will go on until 15th September 2016. Well, I suggest you to book a table prior you visit. And yes, it is a great experience to try out the Chinese cuisine. Please do not miss this opportunity of exploring the authentic Chinese right in the heart of Namma Bengalauru. Note: This article is based on Vegetarian Prospective. Previous Post Afghan Food Experience at Terracotta, Vivanta By Taj, ITPB, Bengaluru. Marvelous, what a weblog it is! This web site gives valuable data to us, keep it up. Thanks for sharing this perfect article. It require minimum time to get ready, It is very easy to bake by everyone!!!!!! !